What does 2019 look like for Samsung TVs? The South Korean manufacturer is, as always, firing on all cylinders. We’re seeing Samsung driving new modular panel technologies, pushing the limits of 8K resolution, and expanding the scope of its in-house Bixby AI, without forgetting to offer some of the best mid-range televisions out there. For now though, there’s little by way of concrete product names or release dates for 2019 – with one or two exceptions. At the CES 2019 tech expo we caught sight of a new 75-inch MicroLED TV named ‘The Window’, as well as a 98-inch version of its existing Q900R 8K QLED television. Samsung is pushing its designer series of televisions like The Window, The Wall, and The Frame, and we’re likely to see upgrades and enhancements to existing models over the coming year. We’re also expecting upgrades to last year’s range of high-end QLED (quantum dot LED) televisions, which included the Q9F, Q8F, Q7C, Q7F, and entry-level Q6F, which we’ve listed for you below. There’ll certainly be more of Samsung’s UHD models – now prefaced with the letters ‘NU’ – and, at the cheaper end, some more traditional HD TVs. With so many models to take in, we thought it’d be beneficial for to see the entire line-up, from the high-end QLED to the entry-level TVs, all on one page. Most are sets released in 2018, but we’ll update this page as their new variations get announced. It’s worth noting that a lot of the specs listed below could potentially change as we get closer to the retail release of these screens, but for the most part the specs you see here should be the components that make it in the final product. Most of the technical advances we see in 2019 will be iterative, rather than anything wholly new from Samsung. Samsung is pushing forward with its MicroLED panels, which feature millions of microscopic blue, red, and green LEDS for an incredible level of color and light control. On the large end, there’s the new 219-inch model of Samsung’s The Wall, and on the less-large-but-still-large end, the 75-inch The Window – made possible by smaller, more compact clusters of LEDS – with both looking ahead to a flexible future where you can customize your TV shape for any size or aspect ratio you please. The virtual assistant Bixby will be one of the few common features across Samsung’s MicroLED, QLED, and Ultra HD lineups – alongside various Samsung smart appliances, phones, and speakers. An ‘improved AI algorithm’ will make your Samsung TV better at recommending and displaying relevant TV content and apps, with expanded use of Bixby voice controls through your Samsung remote – as well as compatibility with Amazon Alexa and Google Assistant smart home devices. Not to mention some smart Remote Access features for connecting to other devices through your TV. The addition of Bixby will also allow the TVs to be compatible with Samsung’s SmartThings smart home platform. Together, Bixby and SmartThings will allow you to control your home from the comfort of your couch, giving you voice control over everything from smart lights to your Samsung SmartThings-enabled refrigerator. This may not be as beneficial for those folks who aren’t quite ready to buy into smart home tech yet, but it’s a nice addition to those of us who already have. On the software side, Samsung sets will be getting AirPlay 2 support for streaming iTunes content from Apple devices. 2019 will also be the first time Apple has offered a dedicated iTunes app for movies and TV shows for a non-Apple manufacturer – for now exclusively on Samsung TVs. Of course, the star of the show for Samsung in 2019 is still the QLED TV screen – essentially a variation on traditional Quantum Dot LED-LCD panels that feature a peak brightness between 1,500 and 2,000 nits. For a reference point, that’s about twice as bright as the competition from 2017 and four to five times as bright as the HD/SDR TV you’re used to watching. We’re likely to see wider expansion of Samsung’s Ambient Mode. When the TV is turned off, Ambient Mode helps the TV mimic the color and pattern of the wall on which the TV is displayed, so that it blends seamlessly into home décor. It can also play music and display information about the news, weather, and traffic as well. While at first limited to QLED TVs, we’re hoping to see the mode trickle down into more affordable devices too. Many high-end Samsung sets also feature the OneConnect box, which outsources all of your HDMI, power inputs and the like into a piece of hardware separate from the TV, preventing a mess of cables hanging down from your new display. Ambient Mode and Samsung’s signature Invisible Cable will help these TVs seamlessly blend into their surroundings. The Wall (available in 143, 219 inches): Almost too big to be true? 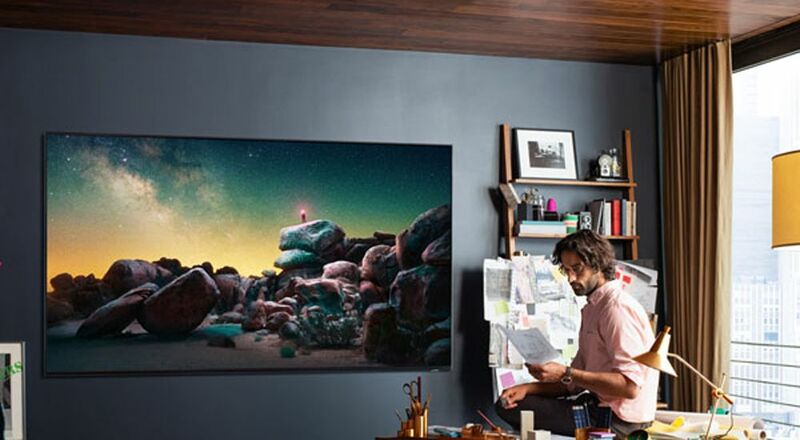 The Wall may not fit on most living room walls, but it’s a testament to Samsung’s desire to impress – featuring millions of microscopic LED for a huge level of color contrast and brightness control over each pixel. Made of a modular series of panels, the size is technically variable, though Samsung is still selling it in general size configurations as a starting point. The first 143-inch model released in late 2018, though we now know a whopping 219-inch version is coming this year. Whichever you’re looking at, you can be sure to expect an absolutely insane price tag. The Window (available in 75-inches only): A smaller, but still objectively huge variation on The Wall television above. It’s still modular, meaning you’ll be able to vary the size somewhat at installation – and we’re expecting it to hit some time in 2019. Samsung’s classiest TV got another upgrade last year, and we’ve heard word that a version of The Frame with a QLED panel is on the way – which feels necessary, given that the picture quality was the only thing letting this gorgeously made hunk of metal down. Blending form and function, this style-focused television may be the most attractive television Samsung has put out. Samsung Q900R QLED TV (available in 65, 75, 85, 98 inches): Unbelievably, Samsung’s monstrous, 85-inch 8K TV is still considered a QLED TV. It’s the top of the list for numerous reasons – size and resolution being the most obvious two – but also its ability to use artificial intelligence upscale SD content to 8K HDR. The first reasonably affordable TV in Samsung’s QLED line-up is the Q9FN. This year you can expect Ambient Mode and better black levels alongside the screen’s insanely iridescent peak brightness. Also new last year was the switch from an edge-lit design to a Direct Full Array panel which – we assume – will offer that improved contrast ratio Samsung’s touting. Moving down the line a bit is Samsung’s Q8FN QLED TV. Like the Q9FN, you’ll see a switch from last year’s edge-lit design to a Direct Full Array panel, Ambient Mode and the addition of Bixby. The Q8FN only uses around a tenth of the backlight dimming zones as its Q9FN sibling – which it can’t compare with – but still looks a treat. The Q7C is, well, Samsung’s Q7 QLED in a divisive curved form factor. The Samsung Q7F was the golden ticket to 2017’s QLED line-up. Offering one of the best price-to-performance ratios in the entire line-up, it was the Q7F that roped droves of AV enthusiasts into buying a QLED TV. The 2018 Q7FN then added Ambient Mode and the addition of Bixby. Last up in the QLED line-up is the Samsung Q6FN QLED TV. It was a special edition that Samsung added around the holidays last year, and now it appears the TV has claimed a permanent spot in the line-up. We know the Q6F is a bit less bright overall than the rest of its Quantum Dot-equipped brethren but if you’re looking for some of the same spectacular colors at a spectacular price, it appears as though the Q6FN will be the best place to get it. A sequel to last year’s MU8500, the Samsung NU8500 Curved Smart TV is almost identical to the NU8000 but features a curved screen instead of a flat one. The NU8500 uses an edge-lit LED LCD panel and a quad-core processor. Expect both HDR10 and HDR10+ support in addition to Bixby and Samsung’s Smart TV platform. This is Samsung’s premier curved TV that doesn’t have the QLED moniker. Underneath the NU8500 is the flat Samsung NU8000. Available in a few additional sizes, you’ll find the same edge-lit LED LCD panel and quad-core processor as the NU8500, not to mention HDR10 and HDR10+ format support. If you can accept a plain ol’ flat TV instead of a curved one, you can save yourself about $100 by opting for an equivalently sized NU8000 model. Stepping down once more, we now come to the NU7300. This screen features Samsung’s PurColor picture technology, making this one of the last TVs in the series to feature Wide Color Gamut, but scales back its effective refresh rate to 60Hz (what Samsung calls Motion Rate 120). The last entry in the 2018 NU Series is Samsung’s NU7100. Like the 7300, you’ll find PurColor and the edge-lit panel powered by a quad-core processor. What are you losing? Bixby. The good news is that you’ll have your choice of screen sizes – the NU7100 will come in a 50-, 55-, 65- and 75-inch variation. As far as we know, Samsung will just offer a single series of Full HD TVs in 2018, the Samsung J5000. The series will come in a few different sizes, puzzlingly three of which are between 48- and 50-inches. The FHD screen will have a 60Hz refresh rate and wide color enhancer, but no smart TV system of its own. That’s it! That’s the entire Samsung TV line-up for 2018. We’ll be grabbing as many hands on experiences as we can with these TVs as we can before they come out later this year, so come back to this page in a few weeks’ time to see how it’s progressed.